Digging deep: A BHP Billiton mine in western Australia. The company, which is the world’s biggest miner, was undeterred by Rio’s rejection. London/Johannesburg: Along-awaited bid was finally made by BHP Billiton Plc. for rival miner Rio Tinto in a move aimed at creating a $350 billion-plus (Rs13.76 trillion) mining giant, but Rio rejected the all-share proposal as too low. Rio shares leapt as much as 30% in London to a record high on Thursday after it said BHP had proposed offering three of its shares for every one Rio share—worth about $140 billion at current prices. If the deal goes through, it would make it the world’s second biggest takeover after mobile phone giant Vodafone Group Plc.’s purchase of Mannesmann AG in 2000 and would create a $360 billion company—roughly the same size as the US computing giant Microsoft Corp.
“The boards of Rio Tinto have given the proposal careful consideration and concluded that it significantly undervalues Rio Tinto and its prospects," Rio, the world’s third biggest miner, said in a statement. BHP, already the world’s biggest miner, was undeterred by Rio’s rejection. “BHP... intends to continue to seek an opportunity to meet and discuss its proposal with Rio Tinto," the company said in a statement. 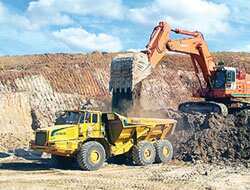 Rio Tinto spokesman Nick Cobban declined to say whether the firm would agree to talks with BHP about a possible link-up. “The board has given its response to BHP on the proposal that it put forward and there it ends, as far as we’re concerned at this stage," he said when asked about BHP’s request. A marriage of BHP and Rio would assemble a massive controlling force across a range of industrial-use commodities such as copper, aluminium, iron ore and coal, but would be likely to face competition concerns. They already jointly own Escondida, the world’s largest copper mine in Chile, and both operate diamond mines in Canada and mine iron ore in Australia. Analysts said a takeover would set off alarm bells for regulators especially in iron ore, where Rio and BHP are the world’s second and third biggest producers respectively, behind Brazil’s Companhia Vale do Rio Doce. BHP said it was aware of competition issues, but gave no details about how it would overcome them. “In preparing its proposal, BHP Billiton has examined in detail the regulatory issues and other practicalities of a combination," BHP said in its statement. Analysts and fund managers said disposals were certainly part of BHP’s game plan in seeking to swallow Rio Tinto. “They must have taken into account that maybe as a combined group they would have to dispose of something," said portfolio manager Henk Groenewald at Coronation Fund Managers in Cape Town. “They’ve got the opportunity to pick the best assets of both companies and sell the worst assets." News of BHP’s proposal comes amid a general downturn in mergers and acquisitions as banks rein in lending in response to losses on low-quality US mortgages. “Clearly, one has to distinguish between M&A that might be funded by capital in credit markets, and here it would appear that it is a share exchange," Insight Investment Management (Global) Ltd fund manager Tim Rees said. “It shows the clear scale of the synergies that might be available (and also) shows confidence within the mining industry about the global economy." Investment banker John Meyer at Fairfax in London said the cost synergies are expected to total than $1 billion. Long-standing speculation of a tie-up between BHP and Rio had gathered pace after Rio completed its $39.1 billion purchase of aluminium group Alcan Inc. on Wednesday. Separately, Rio Tinto said on Thursday that it was considering selling its Energy America unit, the second largest US coal producer.